Q. Do you have hourly or half day rentals? A. No. Our minimum rental is for 1 day and bikes can be used for 24 hours or less. Q. Do you require a deposit for bike rentals? A. 1. Reservation Deposit– We ask for a paypal deposit of $20. USD per bike for reservations that will be applied to the rental price. You can make reservations without a deposit if you would like but we do not hold bikes or child seats or guarantee availability without a deposit. 2. Security Deposit- We believe that most people are honest so in most cases we do not ask for a cash deposit or credit card info. and we do not hold passports or IDs during the bike rental. We do, however, require that you sign a Rental Agreement, provide us with detailed contact info and allow us to take a photo of your passport or ID. Q. Do you provide locks with your rental bikes? A. Yes, absolutely we include Ulocks with keys with every rental bike. We are not aware of any of our competitors who use these superior locks, they choose to save money and provide cheap cable locks that are easily cut by thieves so if you do not rent with us we recommend that you bring your own Ulock with you to Playa Del Carmen to avoid this. Q. What happens if I lose the key to my Ulock that came with my bike rental? A. I charge $20 USD for a lost key because this is a bigger problem for me than most people realize. I have no problem helping people out when they lose a key and several times have had to cut off Ulocks(this was very difficult) with the wrong key broken inside. The problem is at this point I am not able to make copies of the Ulock keys here in Playa so in most cases I only have 2 keys. So when a key is lost it is not safe for me to use the lock anymore for rentals with only one key. the Ulocks cost me from $20.-$60. USD each(they are more expensive in Mexico so I buy as many as I can when I visit the USA). The reason I only charge $20. USD is because I am sometimes able to sell the Ulocks with only one key later and recover some money. You can not keep the Ulock if you lose a key and pay me $20. USD because sometimes I need to use them temporarily when I run short of locks and they can be hard to find here sometimes. Q. Is bike theft a problem in Playa Del Carmen? A. Unfortunately, yes as the city continues to grow bike thieves have gotten more aggressive and will climb over walls in the night and cut through chinsy cable locks to steal your bike. Since we started using Ulocks we have had very few problems and have only had occasional thefts when customers did not use the locks or lock the bikes properly. As long as you are responsible and use the locks we provide it is very unlikely you will be a victim of bike theft. Q. What happens if my rental bike gets stolen? A. In the case of a lost or stolen bike we ask that customers pay for the replacement cost of the bike and lock which is $150. USD per bike in most cases and that is the amount specified in our rental agreements. In most cases we share the bad fortune and refund the cost of the rental since we are only looking to recover our loss. Q. Do you offer insurance for your bike rentals? A. We do not. As far as injury and accident insurance goes you really can not do much better than purchasing travel insurance, which would cover you if you were injured riding a bike in Playa Del Carmen. As far as theft insurance goes, the replacement value of the bikes is really to low to justify the high cost of theft insurance. Q. Do you deliver bikes for Daily Rentals? A. Yes, absolutely but we have a $38. 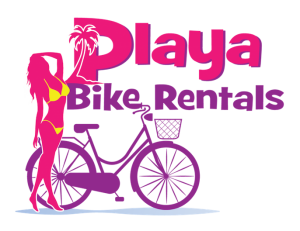 USD minimum per bike for delivery in Playa Centro and $76. USD minimum outside of Playa Centro. During peak high season (Christmas week) we only deliver bikes in Playa Centro so please check with us if you are not sure about your location. Q. Do you deliver to Cancun or Tulum? A. We do not deliver to Cancun but we do deliver to Tulum with a $100. USD minimum. We do not deliver outside Playa Centro during peak high season (Christmas week). Q. Do you offer a discount for large group bike rentals? A. Yes and No. Yes absolutely we negotiate discounts for large groups looking for weekly rentals. We do not, however, have discounts for very large groups looking for 1 day event rentals. At the moment we have 50 bikes and a truck that can carry 10 bikes at one time we will probably have more bikes next year. We like working with large groups looking for 20-50 bikes, but when we commit all our bikes for a one day event we have to turn down other customers interested in weekly rentals so it does not make sense for us to offer a group discount for 1 day events. We also require prepayment for large group one day rentals to hold the bikes. Please contact us and we can give you a fair quote for your group with or without delivery.